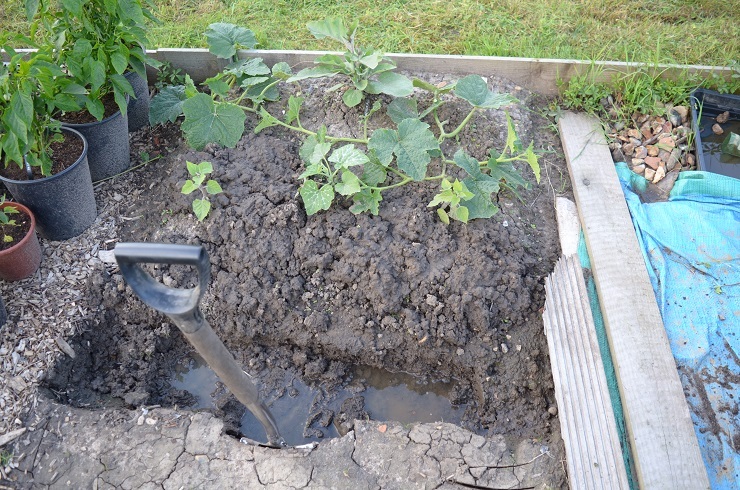 For now it looks as if the monsoon has come to an end, my ark won’t be needed and the water is (gradually) subsiding from the plot. I am still dispatching about 50-70 slugs per visit, but I have hope. 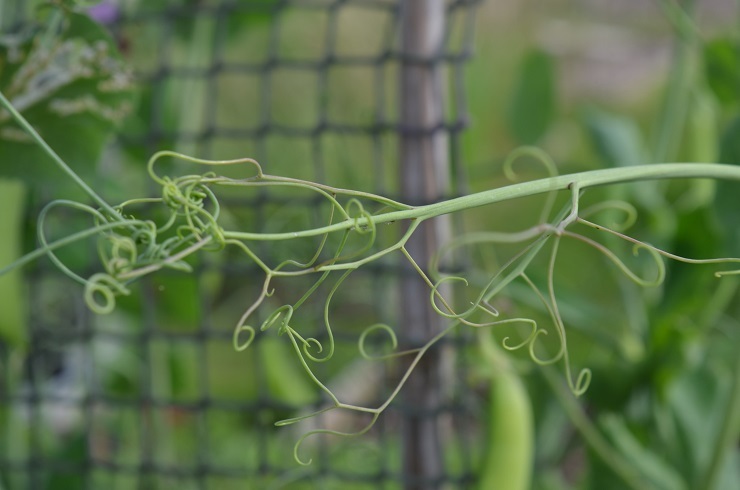 I’ve updated the harvest tallies to the end of June, which at least shows that my slog is starting to show results. If only I could just stop buying stuff! Many of my plants have loved the rain, or at least not died from drowning. The quince tree is particularly happy, which gives me some indication of its watering needs for the future. I have a cracking crop of strawberries and redcurrants ready to pick, and Invicta gooseberries are huge, fat and sweet. 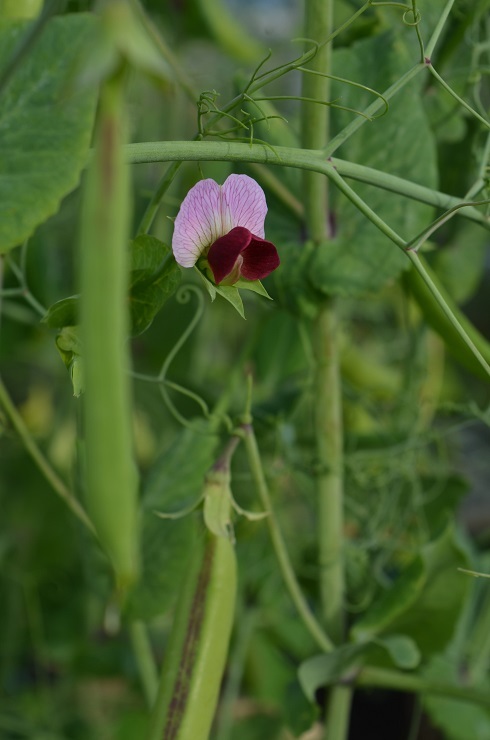 I mentioned peas last time, but the Magno lia Blossom Tendril Pea has the sweetest, crispest sugar snaps I have ever tasted. The hypertendrils are weird-looking, but they do seem to help with airflow. 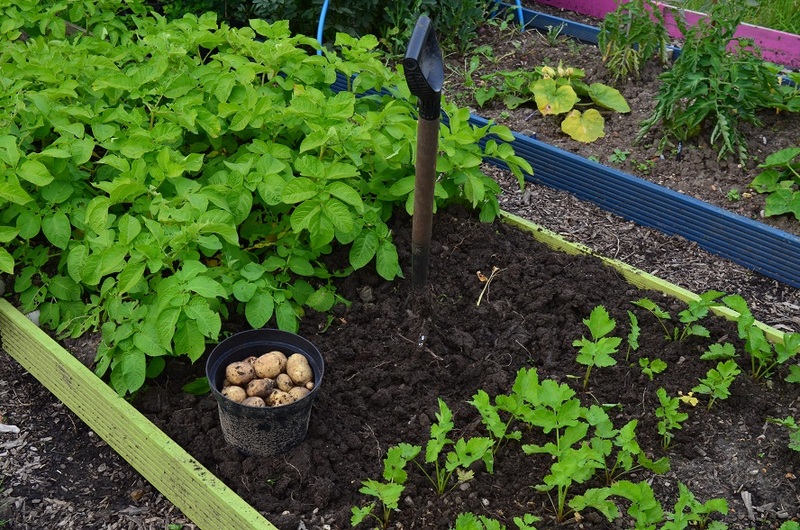 The plants are also happily coping with having been plonked unwittingly on top of a short row of Charlotte spuds. We’ve started eating Dunluce first earlies from the beds and they are DELICIOUS! Crisp and juicy, they cook in no time, turning into the loveliest, soft new potatoes with fantastic flavour. This month I will be mostly eating potatoes…buttered, salted, or both and even cold from the pan. 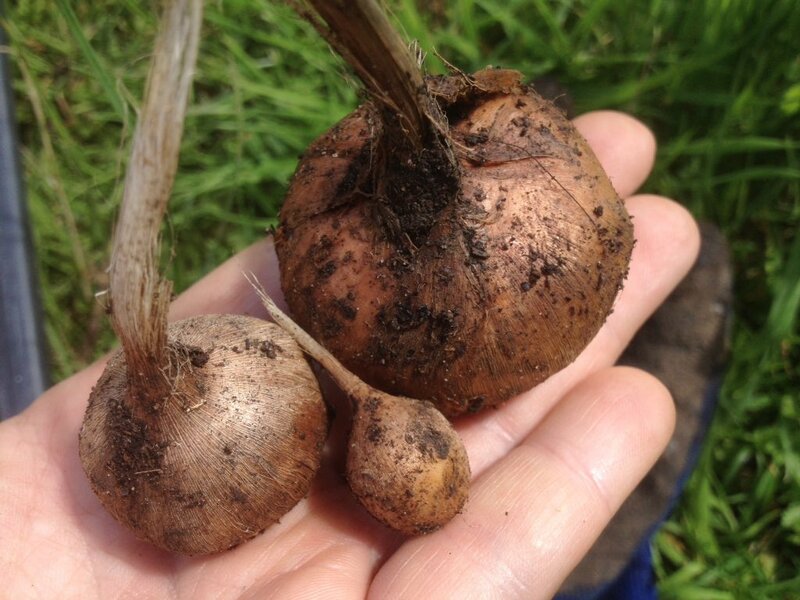 I have been worried about the incessant rain rotting my saffron – plus I couldn’t resist seeing how many corms the big bed had. So, the bed tally last year was 105 corms, this year (drumroll please) I have 477, now stored in a bag of damp compost. Over 130 of those are huge, and I definitely have more than enough corms for 2 full beds this year. There were fewer new corms at the eastern end of the bed, which is shaded by the greenhouse in winter/early spring – but that was where I put the smaller corms, and the fewer corms were correspondingly larger. There might be something in that… I also tipped out the pots I was given at Saffron Central last year – these have multiplied profusely, but, probably from being in small pots, those corms are absolutely tiny. 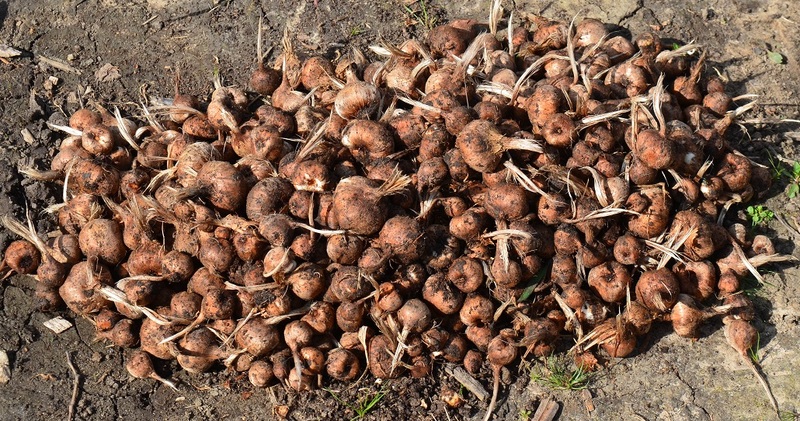 In total, after tipping out the nursery pots of last year’s tiddlers, I have over 800 corms, but I don’t know what to do with all the tiddlers this year. It’s a nice dilemma to have. In the waily waily catalogue of woe Plot 92 has revealed a whacking great negative. I have what looks uncannily like onion white rot. About half my garlic was tiny and/or completely rotten with black skins and soft bulbs. 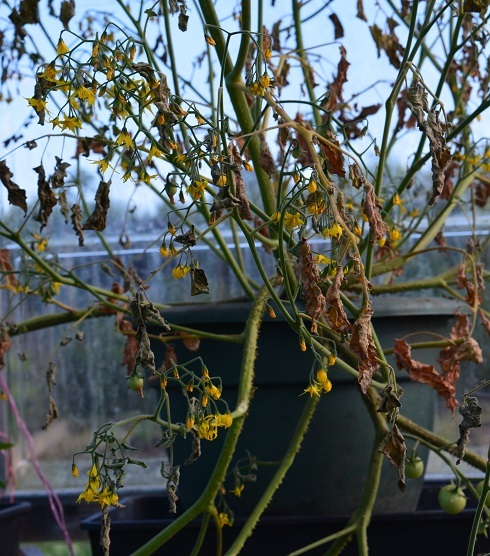 If it is the dreaded Rot, that’s my last year growing anything oniony on #92 and I will be being meticulous with cleaning the tools I use there so I don’t spread it to #100. It could possibly just be the extreme sogginess this year, I’ll have to see how the surviving bulbs do in storage. Secondly, I am living through Slugmageddon. I have barely any beans. As fast as I can grow replacements (where I have seeds for them), the slugs hoover them up. My chicory is non-existent. Steel has entered my heart, and slugs are now dispatched with secateurs rather than lobbing them as far as possible into the cemetery next door. 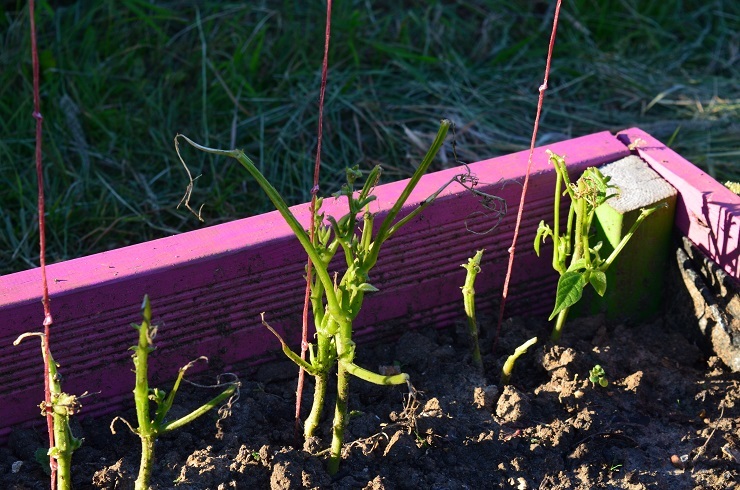 Slugs are also kindly sparing me the pain of any courgette or squash gluts by either eating the growing tips off the plants or munching their fruits. Though actually the courgette nibbles could be mouse-related and perhaps I need to have another word with the cat. Performance-related Dreamies? 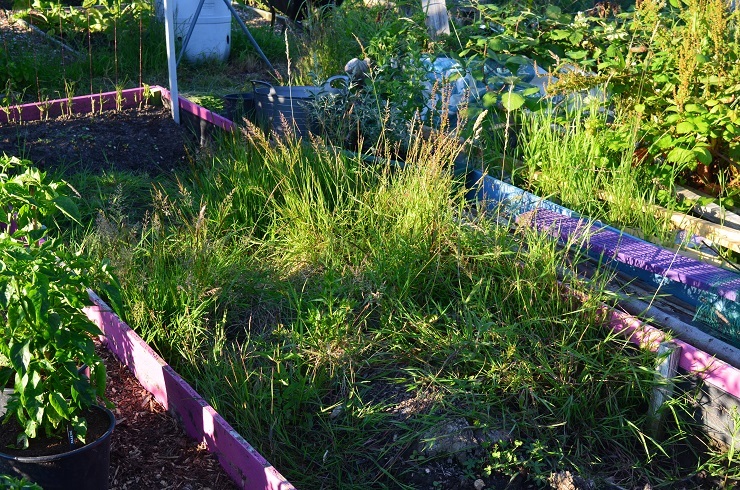 Thirdly, my winter brassica bed is still a never-dug grassland. It should have been finished at the end of last month but it’s waterlogged from the rains. Also, slugs ate all my broccoli seedlings. So now I am contemplating the bleakness of a winter without broccoli, which isn’t a happy place. None of the garden centres have plug plants. Fingers crossed the DIY sheds still have some. And for something completely different, last night was the opening gala for RHS Hampton Court. That means a fantastic sound and light show for us souls over the river. 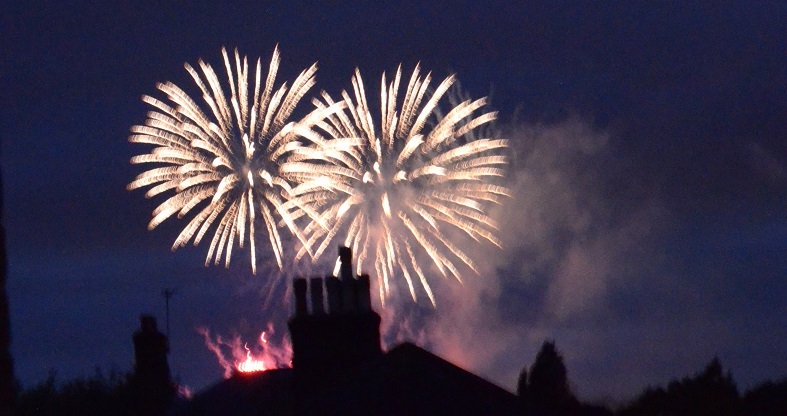 It was REALLY loud, not just the pretty, sparkly whizz-bangs, but also the soundtrack – ending with Land of Hope and Glory bellowing out. Rudely awakened and scrambling for somewhere else to sleep, all our swans and ducks now hate the RHS.